Mac n Cheese made healthy. Seriously healthy and SO easy! Although I feel like I need to put a disclaimer on this post because it has neither macaroni or cheese, but it mimics mac and cheese so well. This dish is dairy-free, gluten-free, soy-free, and nut-free (for any allergy/sensitivity peeps) and only 7 ingredients! Now you may be wondering “well what does it have in it?” Growing up, I ate the typical mac & cheese. The kind with refined noodles and a sauce packed with a lot of milk and cheese. But now, I want something much healthier and that fits into my nutrition beliefs. The main ingredient in this sauce that gives it such a velvety, rich and creamy texture is acorn squash! All winter squash are incredible with their versatility. I’ve simply roasted some acorn squash with diced onions and fresh garlic to really bring out the flavor and create a nice depth, but you don’t even need to roast it. You can still get a super creamy sauce by quickly steaming the squash. After roasting or steaming, all you need is a blender (or immersion blender), nutritional yeast, some cumin, sea salt, and water – no milk of any kind needed here. All that’s left to do is smother some cooked quinoa in it and briefly leave under the broiler to get some color and a bit of a crust texture. It’s beyond easy and so yummy! Rub your diced acorn squash, onion, and garlic with enough coconut oil to coat, and a good pinch of salt. For one large skillet of mac n cheese I used about 1/2 acorn squash. Use as much of the onion and garlic as desired, knowing that more will provide more of those flavors. Roast on about 400ºF until golden brown. Alternatively, you can steam your squash and season with onion and garlic powder if roasting is not an option. Add your squash, onion, and garlic to a blender (or use an immersion blender). Add your nutritional yeast, beginning with about 1/4 the amount of squash that you're using, and a few sprinkle of cumin if using. How much you use will depending on your taste and what you like, and it's very easy to add more after blending and tasting, especially the nutritional yeast. Begin blending while streaming in water until it reaches a super creamy and pourable consistency. Taste. 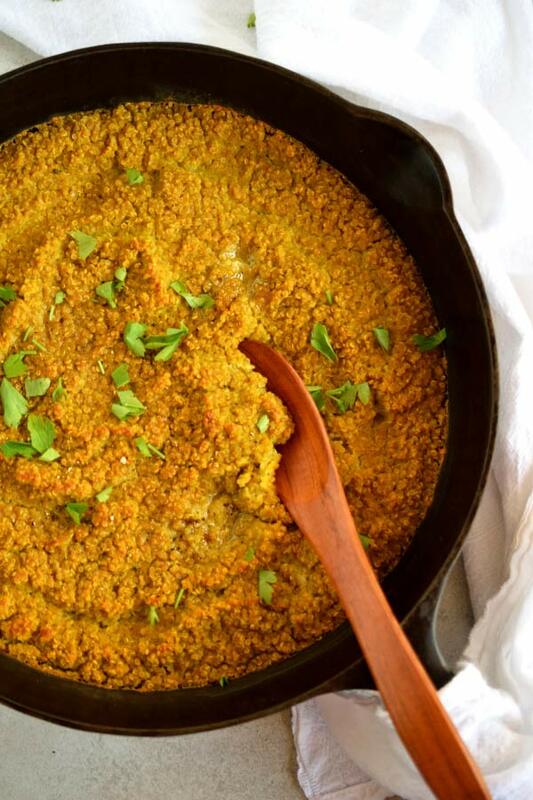 Now is your time to add more nutritional yeast, cumin, and salt if needed. 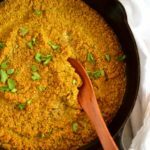 The more nutritional yeast, the more of that "cheesy" flavor and the more cumin will give that smokiness. Salt, obviously to enhance all the flavors. Blend again. 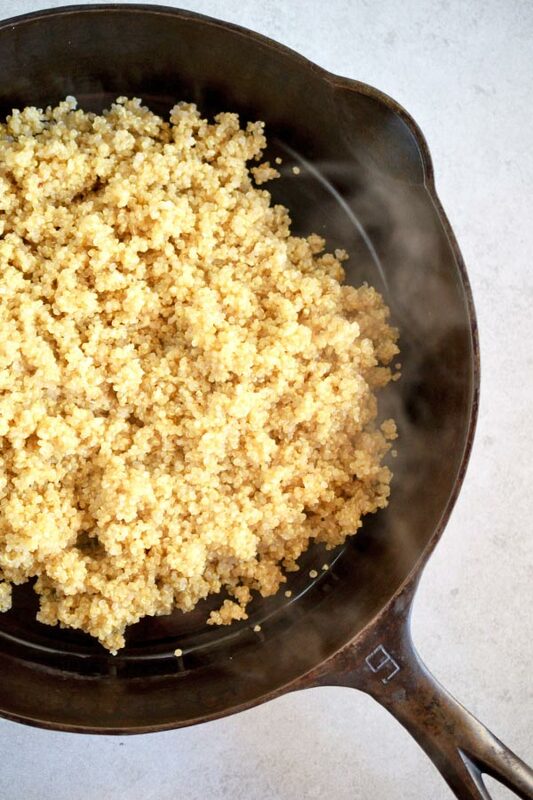 Pour over your cooked quinoa and mix well. You can eat as is or broil for a few minutes to get nice and golden brown on top! 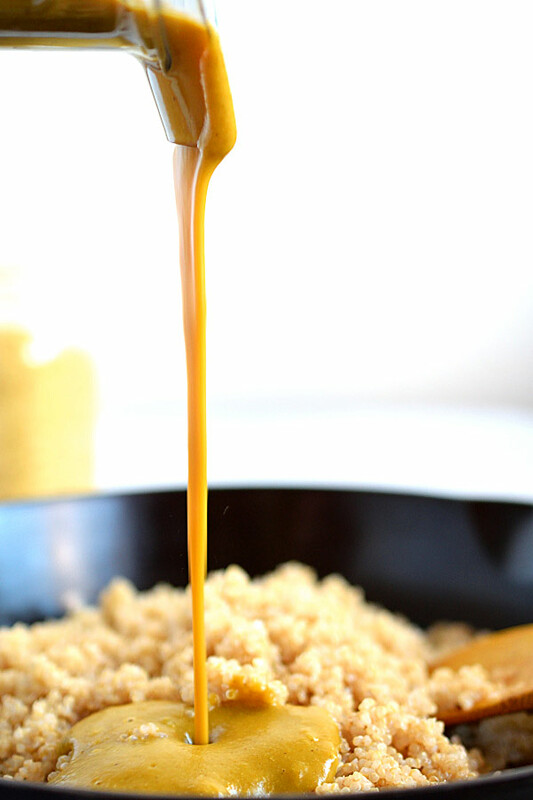 You can do this sauce with other winter squash, like butternut or pumpkin, or even sweet potatoes!